JOHANNESBURG. – Former South African President Jacob Zuma can still expect support from ANC members when he appears in the KwaZulu-Natal High Court in Durban on corruption charges next week with some hinting that they would defy the national executive committee’s (NEC) decision to ban them from wearing party regalia. 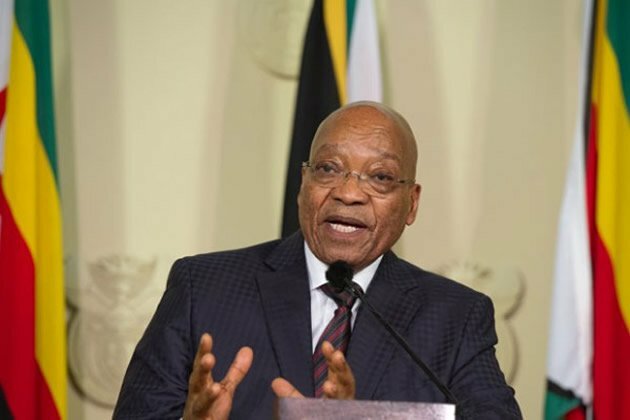 News24 spoke to several party members who declared they would remain ardent Zuma supporters, including provincial and regional leaders and members of the Umkhonto We Sizwe Military Veterans Association (MKMVA). Another offshoot, calling themselves the “Radical Economic Transformation Champions”, are urging South Africans not to ditch the man they dub the “father of radical economic transformation”. After its three-day weekend, the NEC said in a statement, without mentioning Zuma’s name, that it understood both the ANC and society had the right to express their sympathy and solidarity with those called to account by law enforcement agencies, the courts and a judicial commission of inquiry. However, it resolved that those who wanted to show their support, could only do so in their individual capacities and not through the structures of the 106-year-old liberation movement. “Members involved in such actions are discouraged from displaying (the) ANC’s paraphernalia and thus creating the false impression that the ANC as [an] organisation identifies with, or approves of, the misdemeanours of which any member or leader may be accused,” secretary general Ace Magashule said, following the NEC meeting. Controversial Eastern Cape ANC councillor Andile Lungisa is one of those who refuses to be told what to wear when he and a contingent from the province show their support for the former president of the ANC and the country. He told News24 yesterday that the directive issued by the NEC would be like asking him to suspend his membership. “I am not talking about anything that relates to the NEC. When you go there you don’t cease to be a member, because you are going to court, sometimes you must be rational when you take decisions,” said Lungisa. “I will go to court as a member of the ANC, wearing ANC [regalia], with my membership in my pocket,” he added. Lungisa said his support for Zuma stemmed from the ANC’s 2005 national general council, where it was concluded that the former president was being attacked by fellow comrades from within the movement. “When we said Zuma was under attack from internal forces, that attack is directed at Zuma. Even today Zuma is targeted, he is under attack, they want to isolate Zuma. I, Andile Lungisa have not changed from that position of 2005, Andi lulolwane (I am not a bat). I don’t subscribe to what is called the politics of expediency,” said Lungisa. Zuma faces 16 charges, including corruption, money laundering and racketeering. The charges relate to 783 questionable payments he had allegedly received in connection with the controversial multi-billion-rand arms deal. National Prosecuting Authority (NPA) head Shaun Abrahams announced this month that it would prosecute Zuma and he said he believed there were “reasonable prospects of a successful prosecution”. The charges were dropped in 2009 by then NPA boss Mokotedi Mpshe, based on the telephone recordings referred to as “spy tapes”, which were presented to him by Zuma’s legal team. The leaked tapes contained recordings of the telephone conversations between then Scorpions boss Leonard McCarthy and former NPA boss Bulelani Ngcuka, which Zuma’s legal team claimed showed political interference in the decision to charge him. Lungisa is one of many expected to be at Zuma’s side during court appearances. Previously, a group called the Friends of Jacob Zuma emerged to offer him emotional and financial support amid his many trials. This time around there is the Radical Economic Transformation Champions, who are pledging to get South Africans from across the country to support him. One of its members Nkosentsha Shezi, said it was important to rally around Zuma because he was innocent. Shezi, who is also an ANC member, said there were many reasons behind the decision to rally around Zuma besides their belief that he is innocent. “We have honoured him as the father of radical economic transformation. He introduced the world’s biggest ARV programme, which saved the lives of millions, especially black people. “He introduced the 30 percent mining charter, he declared free education for the children of the working class and he’s the one that called for land expropriation without compensation even at the risk of his party not having declared so at that moment,” said Shezi. He added that the Radical Economic Transformation Champions were engaging with many people across the country, who wanted to be there for Zuma. “We are going to gather at King Dinuzulu Park and march to the Durban High Court. On the 5th, we will be there at night waiting for the programme,” explained Shezi. Shezi said the invitation was open to everyone and not just ANC members. He said members of his organisation would attempt to budget enough money to produce T-shirts for those joining the demonstrations so that they were not in ANC regalia. Sihle Zikalala, co-ordinator of the ANC in KwaZulu-Natal’s provincial task team, said he would join those at Zuma’s side next week, but that he respected the directive from the NEC not to wear any of the ANC’s colours. “I think it’s a decision that’s binding to all structures. I would not want to venture on that no structure of the ANC is going to be allowed to encourage people to use the regalia,” he said. Zikalala said there was no decision on how to deal with those who ignored the NEC’s decision on the matter, but that it would be discussed at the time. He said he wanted to personally be there for the former president because he was someone he had worked with previously. “I will be supporting Zuma. It’s just that we have to go on a humanitarian basis that he is one of the ANC, one of the people we have worked with in the province. So we provide solidarity and support to anyone at any time,” said Zikalala. President of the MKMVA Kebby Maphatsoe, said the structure had received the message from the party’s highest decision-making body and would abide by it. “We were cited and we accept the decisions. We will go ahead, but as individuals,” he told News24. Maphatsoe said he would inform the association’s provincial structures of the decision so they could start adjusting their plans accordingly. He admitted that it could be difficult to control members, but had faith that they would abide by the decisions made by the party’s top leadership. In his previous appearances challenging the charges against him, Zuma was backed by the SACP and Cosatu, but they have since had a fallout calling for him to step down last year.